Anytime an aircraft is flying near the stalling speed or the region of reversed command, such as in final approach for a normal landing, the initial part of a go around, or maneuvering in slow flight, it is operating in what is called slow-speed flight. If the aircraft weighs 4,000 pounds, the lift produced by the aircraft must be 4,000 pounds. 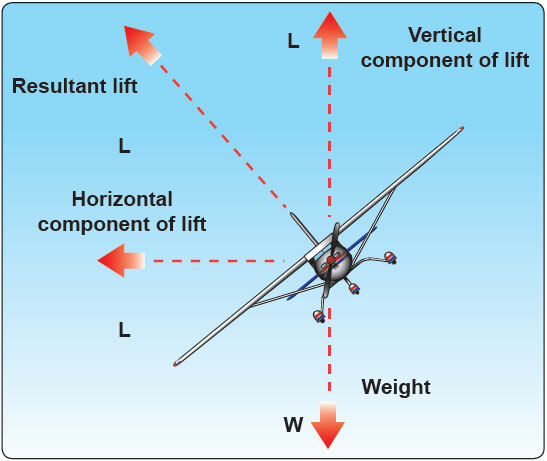 When lift is less than 4,000 pounds, the aircraft is no longer able to sustain level flight, and consequently descends. During intentional descents, this is an important factor and is used in the total control of the aircraft. However, because lift is required during low speed flight and is characterized by high AOA, flaps or other high lift devices are needed to either change the camber of the airfoil, or delay the boundary level separation. 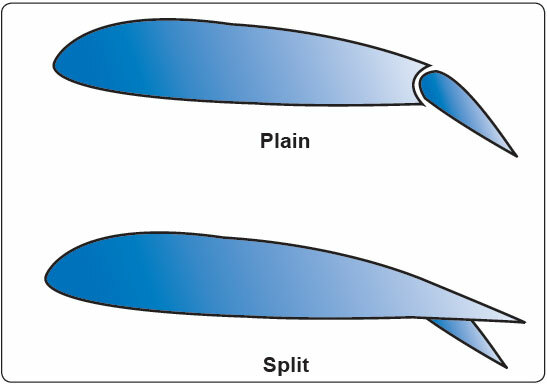 Plain and split flaps [Figure 4-12] are most commonly used to change the camber of an airfoil. 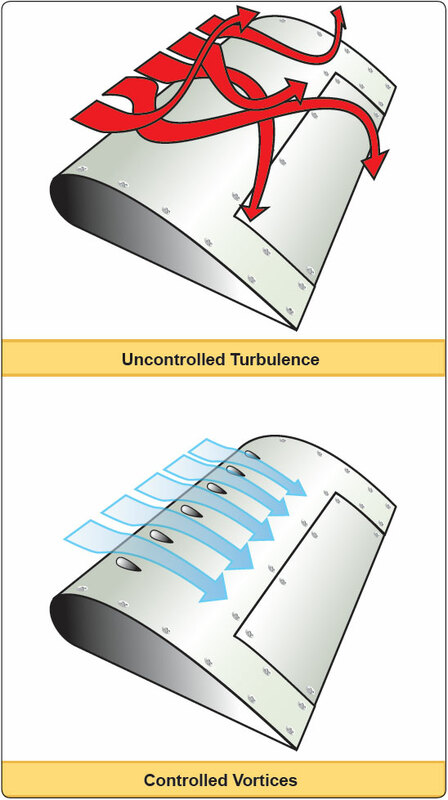 It should be noted that with the application of flaps, the aircraft will stall at a lower AOA. For example, if the basic wing stalls at 18° without flaps, then with the addition of flaps to the CL-MAX position, the new AOA that the wing will stall is 15°. However, the value of lift (flaps extended to the CL-MAX position) produces more lift than lift at 18° on the basic wing. Figure 4-12. Plain and split flaps. Aircraft are usually slowed to a normal landing speed when on the final approach just prior to landing. When slowed to 65 knots, (1.3 VSO), the airplane will be close to point C. [Figure 4-14] At this point, precise control of the pitch and power becomes more crucial for maintaining the correct speed. Pitch and power coordination is necessary because the speed stability is relatively neutral since the speed tends to remain at the new value and not return to the original setting. In addition to the need for more precise airspeed control, the pilot normally changes the aircraft’s configuration by extending landing flaps. This configuration change means the pilot must be alert to unwanted pitch changes at a low altitude. Figure 4-14. Forces in a turn. If allowed to slow several knots, the airplane could enter the region of reversed command. At this point, the airplane could develop an unsafe sink rate and continue to lose speed unless the pilot takes a prompt corrective action. Proper pitch and power coordination is critical in this region due to speed instability and the tendency of increased divergence from the desired speed. Pilots of larger airplanes with higher stall speeds may find the speed they maintain on the instrument approach is near 1.3 VSO, putting them near point C [Figure 4-11] the entire time the airplane is on the final approach segment. In this case, precise speed control is necessary throughout the approach. It may be necessary to temporarily select excessive, or deficient thrust in relation to the target thrust setting in order to quickly correct for airspeed deviations. For example, a pilot is on an instrument approach at 1.3 VSO, a speed near L/DMAX, and knows that a certain power setting maintains that speed. The airplane slows several knots below the desired speed because of a slight reduction in the power setting. The pilot increases the power slightly, and the airplane begins to accelerate, but at a slow rate. 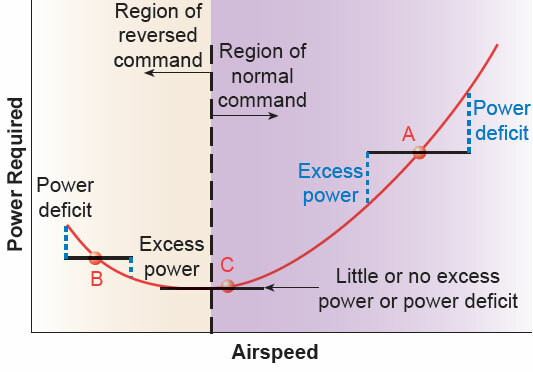 Because the airplane is still in the “flat part” of the drag curve, this slight increase in power will not cause a rapid return to the desired speed. The pilot may need to increase the power higher than normally needed to maintain the new speed, allow the airplane to accelerate, then reduce the power to the setting that maintains the desired speed.